NEW kitchen for 2019! All new cabinets, counters, floors, and appliances. Even an adorable coffee bar. Stay tuned for photos as updates are made. 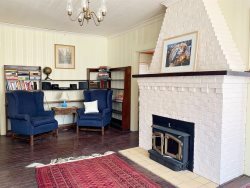 This well loved family home is now available for your enjoyment! Chapman’s Chapter is an outstanding beach home with space for your entire group. Secluded, wooded setting makes you feel like you have your own private retreat. Descend your private steps to the sandy beach along the shore of Lake Michigan and enjoy a day soaking up the sunshine and splashing in the clear water. Back at home, relax on one of the four balconies and marvel at the magnificent sunsets while grilling dinner and making memories. Inside Chapman’s Chapter, soaring ceilings grace the living room along with a seasonal wood burning fireplace and a wall of windows overlooking Lake Michigan. Four generous bedrooms and additional sleeping in the living room allow your group to have privacy while still spending time together. Chapman's Chapter is a historic cottage filled with character and memories of years past. You'll feel like your loved ones have gathered at grandma's beach cottage. Conveniently located 15 minutes from Saugatuck/Douglas or Fennville and 20 minutes from South Haven. This location was perfect for our family. Property and beach access were great for our family needs. Since my son and daughter-in-law lived in Colorado, but just recently moved to Michigan, this is the first year they've been able to join us. 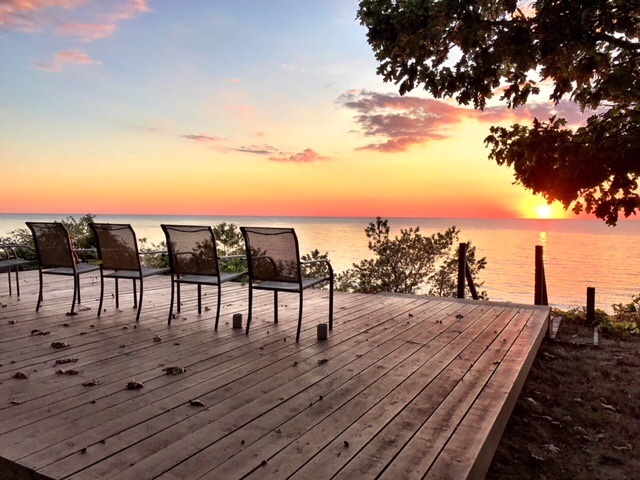 Got this lovely thank you note from my daughter-in-law today: "Dear Nancy & Jim, Thank you so much for hosting a wonderful Fall Weekend in Saugatuck! From the toasty fireplace to exploring the beach to watching the beautiful sunset, it was a fantastic weekend that I hope we can repeat for years to come. Thanks again, luv, Bridget" One more thing, did I mention how delightful it was to see our adult children "unplugged" (yes, they still brought Laptops, IPads and IPhones-as did I-so the home's wifi was greatly appreciated!) but for the most part, they only used them to play music or search the web for nearby attractions and/or directions. We brought our favorite family games, Scrabble and Apples to Apples...but found the Chapman's stash of games and we had an epic Uno tournament that lasted well into the evening hours! Our family weekend was a wonderful time of connection and fun. The fire pit out by the edge of the property was one of our favorites. We say the sunset and the moonset. Really fabulous! We had a wonderful time in Michigan! Please tell the homeowners we had a wonderful time and appreciated them sharing their home with us. The best parts of Chapman's Chapter: plenty of rooms/beds for our entire family, well stocked kitchen pantry, children toys, my husband was the keeper of the fireplace and there was plenty of dry wood in the house, the views out the windows - spectacular, the kindness showing to check out later on Sunday, and working with Mill Pond - you answered all our questions both by phone and email quickly. Little quirks: the oven door didn't completely close, the highchair was cute but we couldn't get the tray to stay on, and the bathtub drained really slow. Overall, we had a fabulous time and YES, we most certainly would visit the area again! Best day of my life, marrying the best person, my wife! The sunsets were spectacular, we ended up getting married inside and the view was beautiful. Highly recommend this place and we can't wait to come back. Very clean inside and out. Unpacked and enjoyed! This was a fun and relaxing family vacation. Staying at the beachfront rental allowed us to enjoy so much more family time than alternative accommodations. We especially loved the size of the cottage, unique style and history behind it! We also have 6 kids in our family, so we felt connected that way. So awesome that the whole family built it together and then actually moved it back from the bluff! There are, however, a very few amount of coffee cups. Woods, view, sunsets on deck, private beach, house is amazing with the family records. Leaving scrapbooks of the family and house, etc almost makes you feel visiting includes you in the story.